Featuring remarkable people communicating passionately and persuasively, TED Talks provide the ELT classroom with inspiring ideas and an unparalleled source of authentic language input. 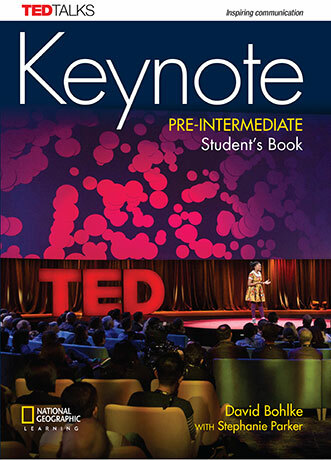 Keynote invites students to explore these life-changing stories and develop a deeper understanding of our world. Underpinned by a carefully designed language syllabus, Keynote enables students to express themselves powerfully and proficiently in English - in their professional and personal lives. Twelve TED Talks provide a springboard for students to develop their authentic listening, criticalthinking and presentation skills. Clear communicative aims of each lesson are linked to 21st century outcomes and encourage students to respond to ideas and find their own voice. Language is presented using real-world input, including infographics, varied text types and profiles of exciting innovators, companies and organizations making a difference. AUTHENTIC LISTENING – carefully selected, supported and exploited. Tailored to work in the classroom. Both Native Speakers and Non-Native Speakers. 21st CENTURY SKILLS SYLLABUS – Critical Thinking, Visual Literacy, Digital Literacy, Global Citizens. REAL WORLD INSPIRATION – Not only through TED Talks but also through the reading texts, and infographics. FUNCTIONAL AND PRACTICAL OUTPUT – focus on everyday language and enabling clear communication in speaking, writing and pronunciation syllabus. PRESENTATION SKILLS SYLLABUS – a bag of transferable tools to develop fluency, confidence and engaging delivery. CREATIVE THINKING – a safe place to try, fail and practice and a way for students to find their own voice through ideas and language.